Here is a fun, quick, and free pattern for you. 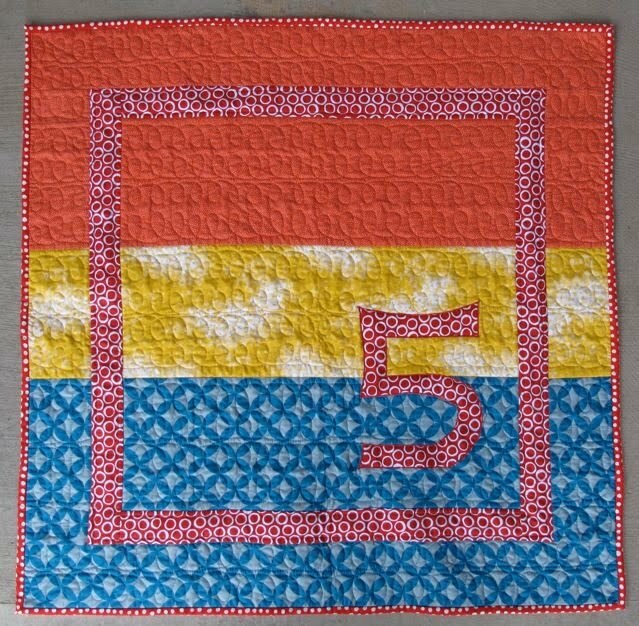 This the Five quilt. It finishes at 36" square. - You will have a few leftovers, but we all love our scraps, right? - Ensure that the fabric you use for the applique and the accent really stands out from the other three fabrics, both in value and colour. 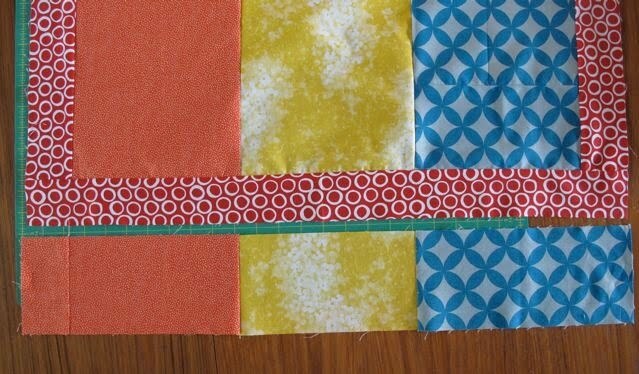 -Cut the 10" square first, then cut your strips. 1. Center portion - sew together the three 24.5" x 8.5" strips in your desired order. Press. 2. 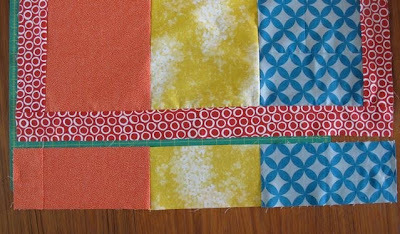 Outside pieced border - sew together two sets of the 4.5" inch strips. Keep the following order: top (10.5") - middle (8.5") - bottom (10.5"). Press. 3. Sew the 24.5" inch accent piece to the sides of the center portion. Press. 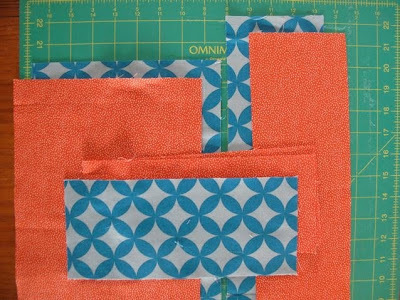 Sew the 28.5" accent pieces to the top and bottom of the center portion. Press. 4. 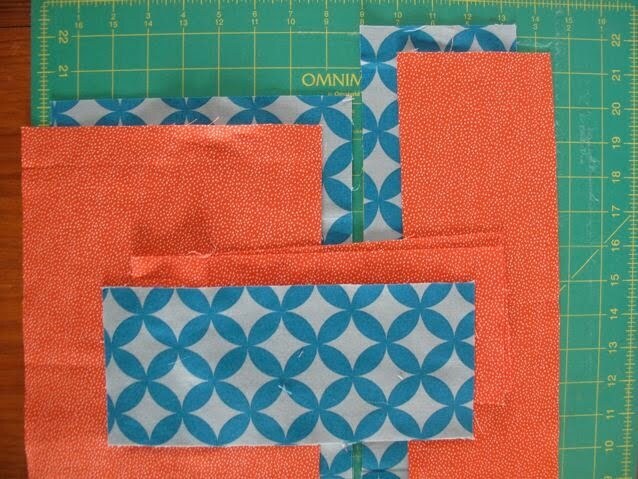 Sew the pieced border to the center/accent portion. Ensure that you line up the seam lines from the center portion to those of the border as best you can. Press. 5. 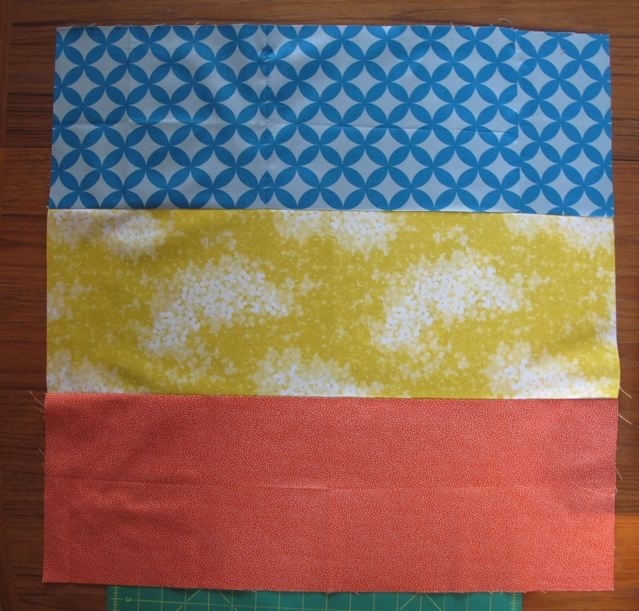 Sew the top and bottom border pieces on. Press. 6. Iron your fusible to the 10 inch square piece of accent fabric. Remembering that your image will be reversed if you draw the desired shape on the fusible, trace and cut out the number or letter you desire. Try a favourite number or a special initial. 7. Float the number/letter a few inches from the accent border in the bottom right or left of the center portion. Be conscious of the seam between the bottom and middle background. You don't want to have a definite line right against the seam. Fuse the number/letter in place. 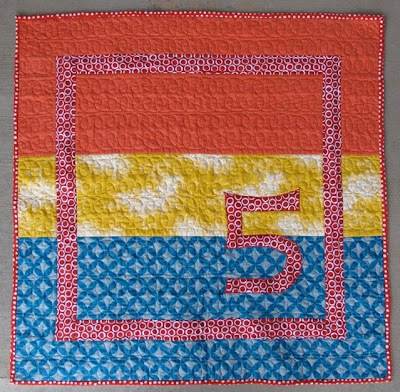 Secure with a satin stitch around the number/letter or wait and secure with your quilting. 8. Baste your quilt and finish it as desired. I chose the loopy quilting in coordinating thread to contrast the sharp linear design. 9. Square up your quilt. 10. Cut and attach your binding strips with your preferred method. Here's mine. 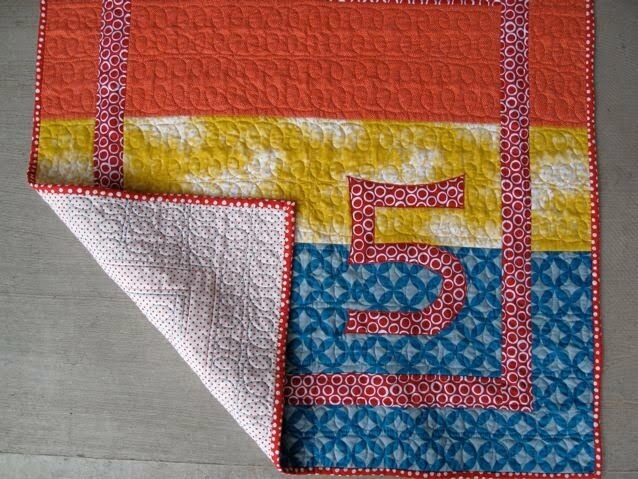 The loopy quilting looks wonderful! A great birthday gift idea, thanks. You have done an excellent job in every respect. Luv it! So cute! I need to give this a try. Love it. Thanks for the pattern/tute! This is so cute! Thanks for the project instructions. 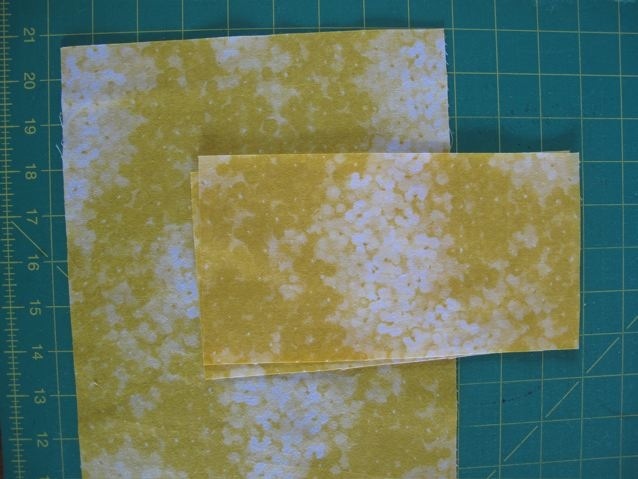 this is such a fun pattern....thanks for sharing it! i could see whipping up something like this for my little guy and putting a P on it. fitting, since that's what we call him anyway. he would LOVE it. I've been following your blog for a few months, clicking links to older posts randomly. I have been enjoying it all, and thinking about signing up for a course with you here in town. What I like best about this one, is how you 'salvaged' the seam in the blue patterned fabric. When I saw the first picture I thought "I'd never piece that without matching the pattern." But in the final project it is covered by the applique and not noticeable at all. It looks wonderful. And because it goes together quickly, I might just take that idea and make each of the four grandchild little cuddle blankets with their age on them. Cute.